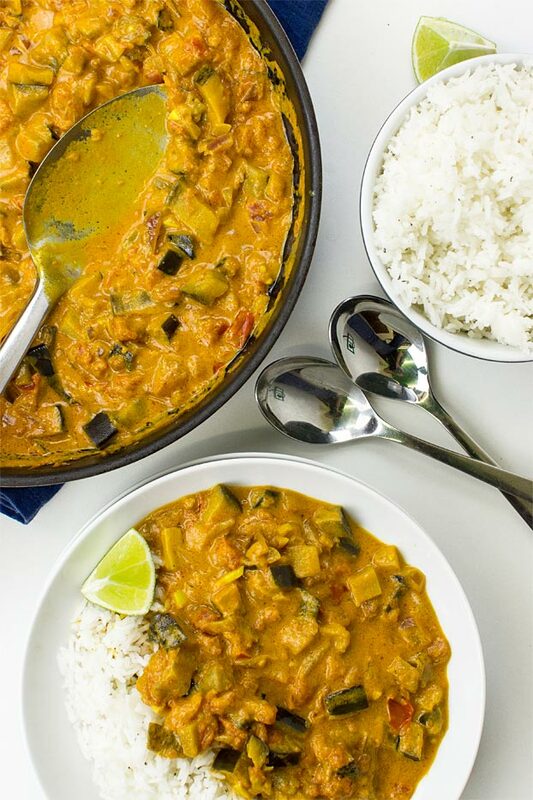 So is this an aubergine curry or an eggplant curry? The answer is, of course, it’s both! 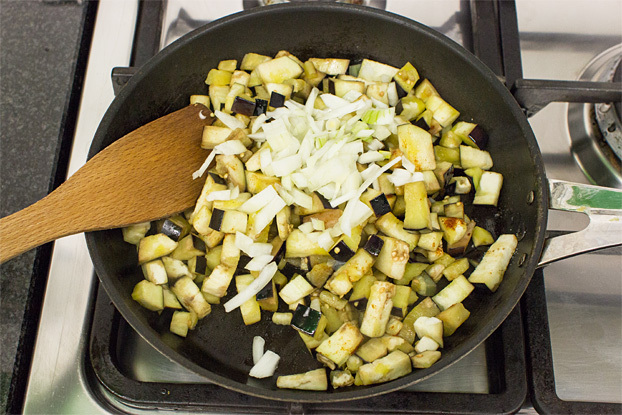 The aubergine, or eggplant is an exceptionally versatile vegetable that – it’s what? It’s not a vegetable? It’s a berry? Really? Fine. Ok, you win. Aubergines/eggplants are berries. But they look like veggies, and they taste like veggies. In fact… they’re awesome in curry! So let’s make aubergine curry. 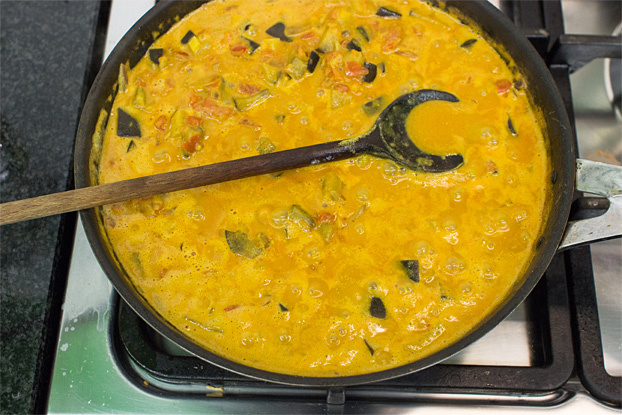 Or eggplant curry. Still confused? Us too, don’t worry. The simple fact is that aubergines and eggplants are the same thing – with different names. In North America and Australia they’re known as eggplants. In Europe and the UK they’re known as aubergines. 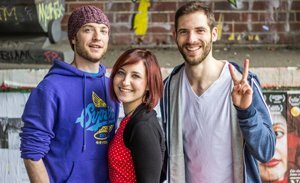 They get called the same and different across the world! I’m from Britain and living in Europe so I’ll stick with aubergine. Though I did once have a job picking eggplants in Australia. It was tough. And hot. Did I mention tough? 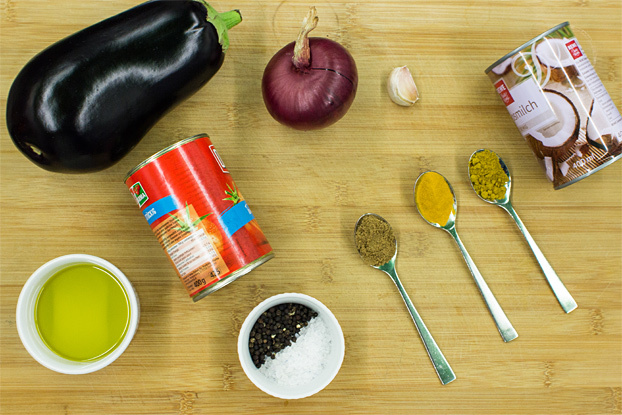 Whatever we call them, Aubergine curry is a fantastic addition to our ever-growing collection of curry recipes. We love curry, and Kat can usually be found developing new varieties. This one is our newest love. Not only is eggplant a great ‘filler’ (important for replacing ‘missing’ meat), they’re really easy to flavour. They’re also really nutritious. In a nutshell they’re full of fiber, B1 and B6 vitamins, antioxidants and various minerals including copper, manganese and copper. Aubergines can go off pretty quickly and they’re also quite sensitive to bruising and improper storage. It’s best to keep them somewhere dark and cool (like the fridge or chilled storage room) and away from the damp. Try not to nick or cut them. When buying an aubergine/eggplant, find one that is deep in colour and feels ‘heavy’ for its size. When the skin is pressed it should spring right back. If it stays indented, looks blemished or wrinkled then its best days are probably behind. Pick another! The seeds in an eggplant are edible (and good for you) so it’s a really easy vegetable (or fruit) to prepare. Just give it a quick wash, slice the stem off and a little from the bottom and you’re good to go. No peeling or de-seeding is necessary. So, grab your eggplant, grab your pan and get going! 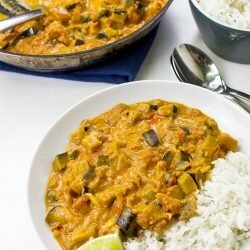 Aubergine curry is a quick recipe – perfect for those evenings when you want some tasty comfort food and you want it NOW! 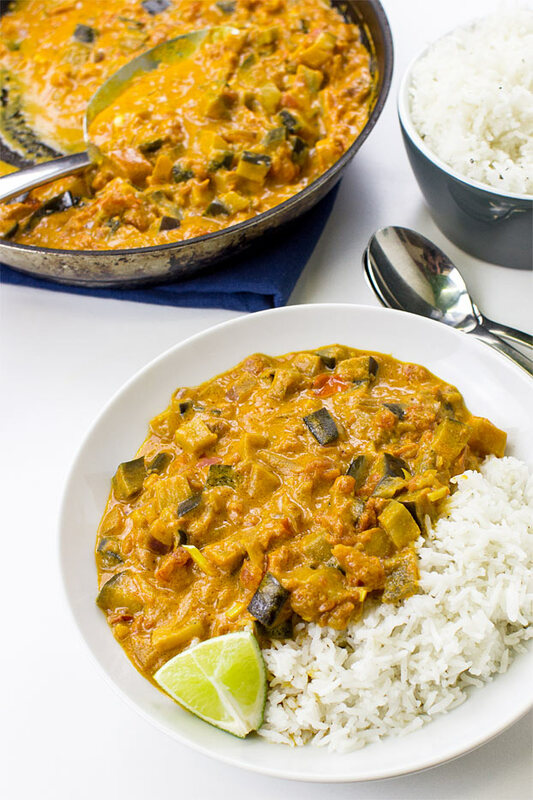 This amazing aubergine curry (or eggplant curry) is quick, vegan and soooo tasty. Brought to you by the kings of curry. If using rice, cook according to packet instructions. Cut the aubergine into small cubes. Fry in a large pan with the olive oil on high heat. Stir well so it doesn’t burn. In the meantime dice the onion and throw it in too. Put it back to a medium heat and cook for 5-6 minutes. Crush or dice the garlic. Stir in the garlic, garam masala, turmeric and ground coriander. Cook for another 3-4 minutes, stirring well. Pour in the chopped tomatoes and coconut milk. Simmer for about 15 minutes. The coconut milk thickens so stop cooking when it is at the right consistency for you. Stir in the sugar or mango chutney if you like it a little sweeter. 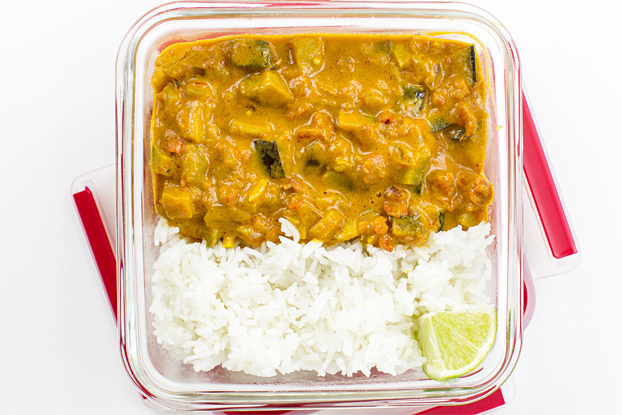 We have some other awesomeeeeeee curries on the site. 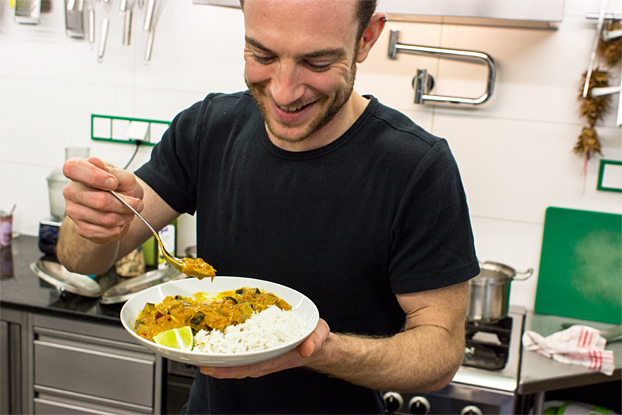 Our most popular is this lovely vegan chickpea curry. This red onion chutney is also perfect for serving with your curry. Please note our nutritional information does not contain any sugar, chutney, rice, naan bread or poppadoms. 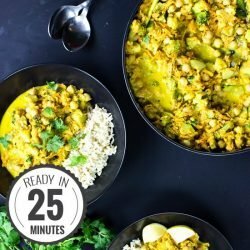 This looks like an Indian traditional recipe and It looks delicious. 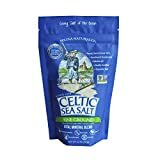 I have never seen like this before rice with this recipe. Looks delicious! 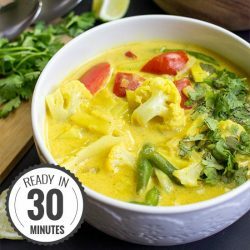 Should I use full-fat coconut milk? Tins and cans come in different sizes. What size tin of tomatoes and what size can of coconut milk, what size of eggplant. It looks great but sizes are needed. This was delicious! 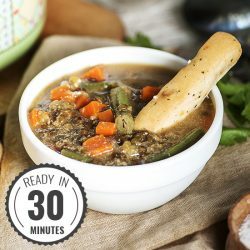 I was skeptical even as I was making it because it seemed so simple and fast, but it was very flavorful. I used full fat coconut milk and added 2 T Major Grey chutney at the end to round it out. I’m not sure how much the eggplant weighed but it was pretty big, and I used a 14.5 oz. can of tomatoes and a 13.5 oz. 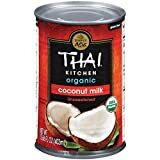 can of coconut milk.